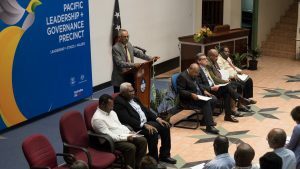 UPNG has educated some of PNG’s most prominent leaders. The University of Papua New Guinea’s School of Business and Public Policy strives to create private and public sector leaders through the pursuit of excellence in learning, discovery, and impact for both Papua New Guinea and the Pacific Region. The School has positioned itself as one of the leading business schools in Papua New Guinea and an emerging institution in the Asia-Pacific Region. Its vision is for business and public policy that drive sustainable growth in Papua New Guinea. The School of Business and Public Policy is committed to the values that are enshrined in the National Public Service’s Ethics and Values-Based Executive Leadership and Management Capability Framework, and the Gender Equity and Social Inclusion Policy. It also remains dedicated to its own academic values – equity, inclusiveness, collegiality, academic rigour and intellectual freedom – and is focused on forging strong links with industry and producing graduates who are work-ready. School of Business Executive Dean Professor Lekshmi N. Pillai launches the Master of Economic and Public Policy. The Precinct is supporting the School of Business to become a regional centre of excellence in the important governance disciplines of economics and public policy, providing direct benefits to students and building the capacity of faculty members. 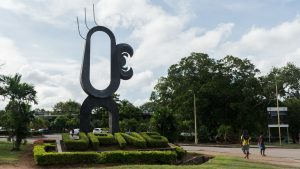 It has further forged the historical partnership between the University of Papua New Guinea and the Crawford School of Public Policy at the Australian National University. This partnership is supporting the school to become a research hub, enabling academics and students to contribute to the nation’s understanding of the challenges and opportunities it faces. Australian National University academics seconded through the partnership live in Port Moresby and are part of the School of Business and Public Policy team. They teach economics and public policy subjects to hundreds of undergraduate students each year, and assist with curricula design, capacity development and research agendas. The seconded academics also teach subjects as part of the Master of Economics and Public Policy, which was launched in March 2017 with Precinct support. School of Business and Public Policy students celebrate their graduation ceremony. 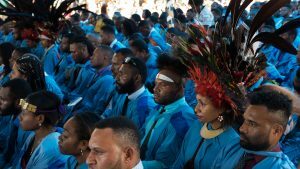 The Master of Economic and Public Policy continues the University of Papua New Guinea tradition of producing high-quality graduates; technically skilled and capable leaders who can apply their qualities in a way that is relevant to Papua New Guinea. The degree is designed to develop professionals with the knowledge and ability to create and implement effective policy in the national interest. The new master’s program exemplifies the School’s renewed focus on economics and public policy, and coincides with the development of a new strategic plan to set the direction for the school to 2022. The five-year strategy will complement new learning infrastructure being delivered through the Precinct. The new School of Business and Public Policy Building will provide international-standard spaces for teaching, research and study. It will promote a contemporary style of learning, based on enquiry, discussion and adult learning. The building will also be accessible by people living with disabilities, reflecting the Precinct’s emphasis on social inclusion.